2017 Race Bred Stud Colt by stakes producing sire Bug Among Thorns. Bug Among Thorns is a Triple A producer and Stakes Producer. He is the son of champion One Rare Bug and his dam is the half sister to Dash For Cash. 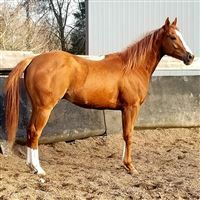 I can't find one thing I would change about this stand up colt "Seven" ! 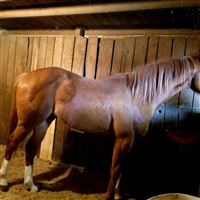 Flashy with 3 white legs *Blaze Face *Flaxen Mane and Tail plus he moves Beautifully on top of the ground . Seven is a phenomenal January baby 2 and ready to start now ! Smart as they come. Indiana Bred and Foaled eligible to run for $600k in Stakes Races alone.